I’ve shot in L.A. a lot. I’ve shot here so much, I used to think, “Wow, I really want to travel someday,” and now that I am traveling, I’m like,“Wow, I really want to stay home.” I don’t get a lot of paparazzi, but people have shown up on my doorstep. One time a girl was there, saying, “Michael, you really touched me,” and I’m like, “I didn’t touch you—at all! I have no idea what you’re talking about.” Then she’s crying and like, “You know that scene you had in Eastbound & Down…” I think she’s going to say it was in Crash or World Trade Center. Instead she’s moved by an oddball part in a dark comedy series? I went from freaked out to pissed to confused. When I moved here from Chicago in 1996, I first lived in the Oakwood apartments. I moved to Hollywood for a month—Highland and Santa Monica—but back then there were so many crackheads, it just wasn’t cool. Eventually I moved to Los Feliz, which is where I’ve stayed. I’ve been here long enough to see Silver Lake has changed. It started off with a comic book store, then slowly but surely these great places came in. When my wife was pregnant in 2008, for exercise we used to walk to Intelligentsia at Sunset Junction. I love Cafe Stella and the Black Cat. The place I don’t want a lot of people to know about is Pho Café on Sunset near Silver Lake Boulevard. I don’t think they even have a sign. They just take your name and you have to wait—they don’t care who you think you are. 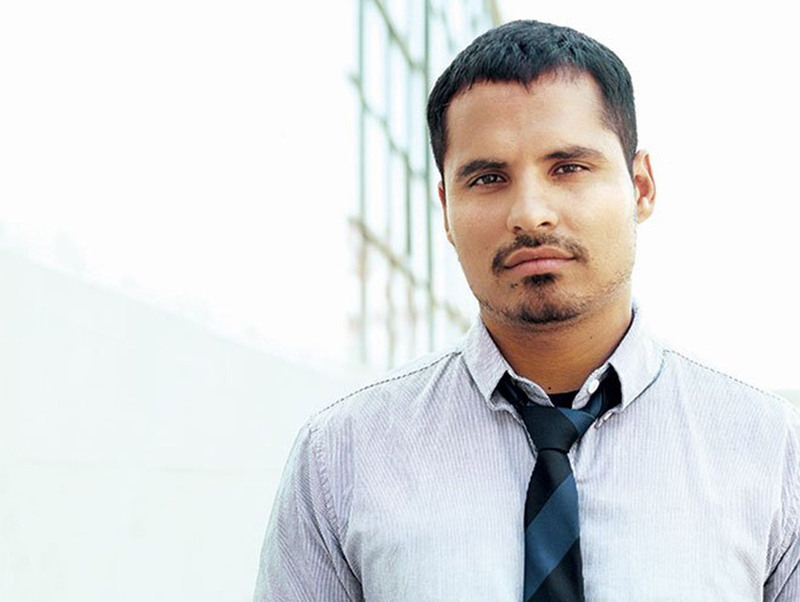 Peña’s titular role as the legendary activist is his heaviest yet—literally (he gained 30 pounds for the part). As Mike Zavala, Peña captured the grit and grind as a rookie LAPD cop in David Ayer’s masterfully written and directed drama. His breakout role in Paul Haggis’s L.A.-based ensemble piece helped the film nab a Best Picture Oscar. I came to Los Angeles to be an actor, so right off the bat I wasn’t exposed to a whole bunch of crime and I didn’t live in the ghetto. But I’ve been lucky enough to see the stuff that not everybody sees. The film End of Watch was shot in South L.A.—the real deal. Jake Gyllenhaal and I did five months of research with the LAPD, including 30 ride-alongs and tactical training. I saw people who’d been shot, stabbed, and beat up. That film really opened my eyes to the idea that 80 percent of any place is good and 20 percent is out to get you. When you go to South L.A., there are certain people who are shady, but the same goes in Beverly Hills. It may be a different kind of shady, but it’s the same percentage. I have no qualms going to East L.A. and eating at a place where somebody else might be freaked out. My girl and I—we’re foodies. Going to Bäco Mercat is cool, but so is going to Guisados on Cesar E. Chavez Avenue in Boyle Heights. I have two tattoos; one is of my son’s name, and I love it—it’s got the right aesthetic. I’m Mexican and we have a certain body type, and for some reason that kind of tattoo across your chest works. I did it in one sitting at the Shamrock Social Club in West Hollywood. While I was in there, people were like, “What’s up, Mike?” That’s one of the great things about Los Angeles. It’s not a fake city to me. It’s filled with people trying to do the right thing and work hard at making good food and—hopefully—good movies and TV.